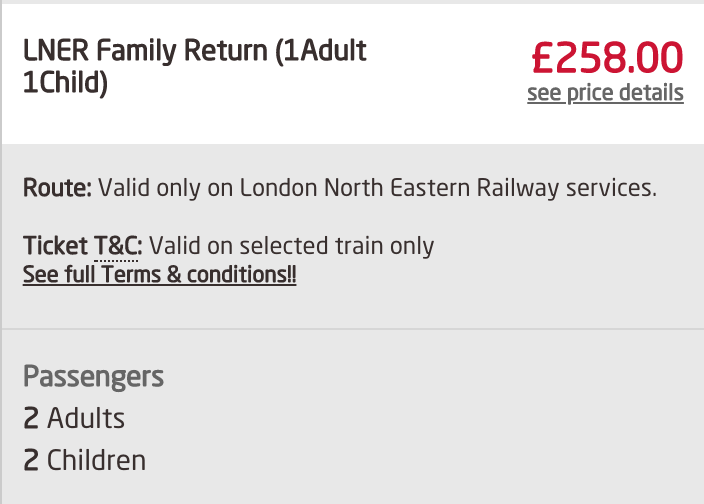 LNER have announced today they've launched a new 'family' ticket. The idea of this ticket is it gives you a fixed price for upto two adults and four children (but there must be at least one adult and one child) as long as you book at least a week in advance and there's availability on the train you choose to travel on. More information on the LNER website. It seems a good idea to capture market share from families that may be put off train travel thinking it's cheaper to just get in the car particularly if a child wants to bring a friend along. So it's good in theory, unfortunately they seem to have gone live without properly testing the retail of these tickets from their own website. The key point to remember is this fare should be the same for one adult and one child as it is for the maximum of two adults and four children. All these tickets are the same price which is £129 return for Newcastle to King's Cross. The booking engine is only recognising the one adult, one child version of this ticket so only correctly prices up this ticket if you're travelling as one adult and one child. If you're travelling as 2 adults and 2 children it will then try and sell you two tickets for one adult and one child which means you get charged double! As none of the other ticket types are recognised by the booking engine it's not offering this ticket for any other combination. Here's some screenshots to show what happens when you select 2 adults and 2 children. It's clear here that it's incorrectly retailing 2x(1 adult 1 child) family tickets rather than the 2 adults 2 children version of the ticket. This means any unsuspecting passengers will be paying double. If you're travelling as a group of 2 adults and 2 children you could be charged double what you should be if you choose to take advantage of this ticket. This is not the first time that Virgin Trains East Coast (as they were) has had issues on their website that will overcharge passengers and it's likely it won't be the last. LNER needs to care more about quality assurance. I noticed this issue as soon as I found out about the tickets. It's almost been a year since VTEC launched the new website and despite me pointing out the flaws it does seem that they keep on making more mistakes. We're currently in the school holiday period, a lot of people will be looking to travel. This new ticket type has been promoted on social media but has been promoted before it was ready to retail. Hopefully they'll be able to sort this out quickly.